My plan for this April Fools Day was to play this deck (that’s not all that foolish, just fun). I played the whole night with the same two guys (from the Exava game). I had okay lands at the beginning, but black was hard to come by at first (Tainted Isle wasn’t active), and then suddenly I had a ton of black cards in hand and the wrong mana. Sisay did a lot of ramping. I finally got Lazav out and Ostracized a Linvala from Sisay (because if you’re going to play Linvala in your deck, I’m dang sure going to make sure it’s me that gets to play it!). GrimGrin cast a Fleshbag Marauder though and it got Sisay and Lazav. However, I had a Sepulchral Primordial in the grave yard and I reanimated it (of course getting back Linvala). Sisay was messing about with Dromoka and Selvala (though I stole his Magewright Stone … or one of those un-tapper things). I soul ransomed Selvala. GrimGrin played Geralf, but Linvala ruined his fun, so he found a way to kill Linvala, and then used Crypt Rats to kill stuff. He swung at me with big zombies, but I turned them to Frogs. Then Sisay got Avacyn and a whole bunch more (though we did counter an Elesh Norn!). Then we died. This is the Lazav version of SakaSiLazavumgarima. It runs 25 blue cards that are all about Copying stuff and 25 Black or Gold/Hybrid UB cards that are all about Stealing or copying stuff, and a package of 12 artifacts/spot removal (like the Monkey Maker and Curse of Swine). The idea for the deck came from an old (circa 2002) Extended deck my friend and I made with a fully Transformative Sideboard (it started out as a combo deck, but you’d board’ 15 and make it a Counter Sliver deck, and you could board the combo back in in game three and play it AND counter silver). The deck Originally was my Thada Adel deck, but I took out the merfolk to make a Tiny Leaders deck. I started rebuilding it as Sakashima, but partway through also got the bug to make a Lazav deck. They were fighting eachother for cards, so I thought “why not just make the decks share?” When Silumgar was spoiled, I realized it had to be a Tripartite General deck. Sakashima is the Blue Copy and Blue Steal packages, Lazav is Blue Copy and Black/Gold steal/copy pagage, Silumgar is Black/Gold and the Blue Steal package. This game saw Marath get cast 6 times and be huge (thanks to a Doubling Season, Mirari’s Wake, Mana Echoes, Gaea’s Cradle etc.). Krenko had a threatening position for awhile with 18 goblins that were hasty and 2/2, and that was able to basically destroy Zeganna. My Sol’Kanar never really got rolling. I plinked away with a Shadowmage Infiltrator, tried to get going with Dominus of Fealty (Which was killed by Marath, who had untapped lands hidden behind a tall drink, and was able to ping it after it blocked). The only trick I really got to do was a Spinal Embrace, and reanimation of a Wurmcoil Engine. Marath ended up killing everyone else with an Elspeth Sun’s Champion Emblem. This is mostly a UBR “fun”-stuff deck that splintered off from leftovers from building Ashling the Extinguisher, nu-Rakdos and Gwendlyn di Corci. I wanted an excuse to play Prince of Thralls and a few other multi-colored cards like Elder Mastery and such. It’s fun to play, but it’s not really a go-to deck. It’s just as happy to beat down with the general as it is to try to steal things from other people. Sol’Kanar is a fan of Urborg. Since no one else had shown up, we decided to play one last game. A discard deck isn’t a great match-up for a crazy recursion deck, but I’d been carrying it around for awhile and decided to get it over with. I started with 2 lands and a Rakdos Signet. 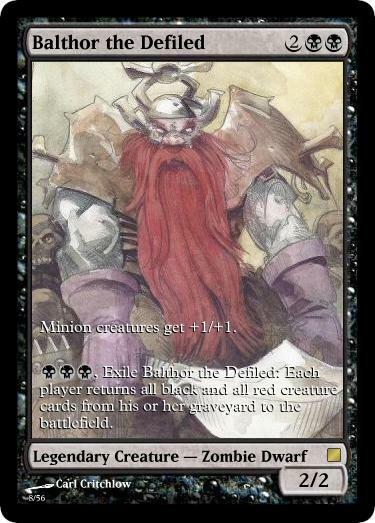 Balthor had an early Geralf’s messenger. I had no 3rd land drop, and an Evolving Wilds on turn 4. I played a Blizzard Specter and a Liliana’s spectre, which I used to chump block Geth. I had a Polluted bonds, but Geth just kept stealing my stuff. I got back my Blazing Spectre, but Geth grabbed Alexi, Zephyr Mage, Greel the Mindraker, milled me into an Illusionist’s Bracers (which he took), and a bunch of other things. I don’t remember if I died to damage or to being Milled out. This was a deck that was built at the same time as Sol’Kanar, and around the same time that I pulled the discard elements out of Oona. 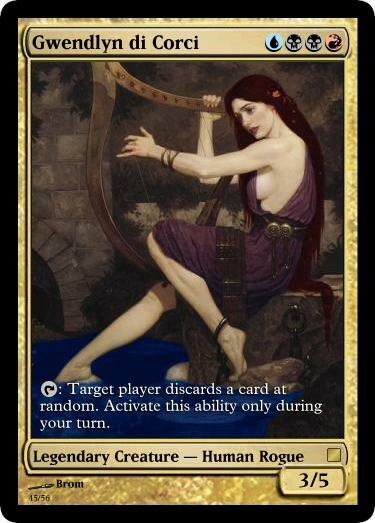 Straight up discard isn’t great in EDH (and it’s not always that much fun to play with or against), but I really liked the Proxy I made for my Italian Gwendlyn from a favorite Dragon Magazine cover image. Lots of spells and creatures that make discard happen (but in a different way from my Teysa Spirits/Discard deck). There’s also a slight bounce theme to it. Oh joy, another game of when will it combo. I started out with a fist full of lands. Nicol Bolas starts the game with a Jace for the billionth time, and adds a Sensei’s divining top for fun. Child of Alara is piloted by someone I haven’t played before, so I don’t know if it’s a fun deck or a just-for-the-colors-to-combo deck (or something in between), he starts with a mix of tri-lands and tapped 2 color lands and a Joiner Adept. I get out a Reassembling Skeleton and play a Moan of the Unhallowed to get fuel for the Boss Zombie, which I cast on Turn 5, giving Balthor the two cards (even though he’s a perennial danger). Balthor, both dangerously and perennially, plays a gravecrawler and gets out Mikaeus and some other dudes. I get a Swing in with Tresserhorn on Bolas, and I’ve got cool stuff in hand as well. Bolas casts Damnation and I let Tresserhorn die (figuring Balthor is going to get popped soon enough, or I’ll just use some recursion. Child of Alara doesn’t go to the graveyard. Bolas has been tutoring a lot. I flash back the Moan of the Unhallowed and then Gravedigger back my general. Then Bolas plays a Palinchron and a Deadeye Navigator (and I’m almost surprised that it’s not Kiki-Jiki/Exarch). By this time a fifth person has shown up, and I switch tables. The other new guy asks if there’s anywhere else that plays on Wednesday nights and heads out too. This deck was built right after Innistrad came out, mostly just to throw a pile of Zombies together. I don’t even think I updated it after that when other sets came out in the block. It’s not all that thought-out, but I’ve won games with it. Lord T often comes out on turn 5 (with a regeneration mana), and the deck is quite a bit about swinging with him for a lot of damage. Inquisitor’s Flail is a good complement to the Lord’s big Axe.